Photo by Kim Millie Luke. Red Red 2010-Junior Roller Derby. This has been a busy weekend. I don’t know everything that went on in the Roller Derby world, but here are some things of significance: The first German championship was held in Berlin, and in a round-robin tournament the Stuttgart team defeated the Berlin Bombshells 128-124 in a game that came down to the last jam. (By the way, I love the irony of many of the names chosen by the teams that don’t exactly honor their city: Berlin Bombshells, Dallas – Assassination City, Seattle -Rat City; not names that the Chamber of Commerce would choose). In Chicago, the first banked track game in many years and the last official 75th anniversary event took place as the LA Derby Dolls skated the Windy City Rollers. In Auckland New Zealand, the local team (Pirate City – another one) won the championship. And there were other significant matches that took place. I and my friend Jim Weymouth went to Woodland, approximately an hour and twenty minutes from my house, to attend Red Red. What an amazing event: The Sac City Rollers work all year on this all-day skating fest which benefits the Sacramento Food Bank. And what a great concept: over a dozen leagues from Oregon, Nevada, all throughout California come to compete on a different basis. The players are assigned to different teams that are designated by a color, and starting at 10 in the morning and going till about 10 at night they compete in half hour games to get to the final championship game. Unfortunately, I didn’t stay to the end so I cannot tell you what color won. But these women get to know each other, skate with each other for the first time, and even develop a greater bond beyond their teams. Last year the event raised over $5000 for the Food Bank; I am sure that yesterday raised a lot more. Obviously, it was one match that The Commissioner did not accept comp tickets for, and I am proud to say that Jim and I shopped for some canned goods and other items to bring with us. We spent time talking to the wonderful women of the Sac City Rollers who although facing hardships themselves – so typical of the new Derby women – put all the hard work in to make it happen. One was a geneticist who had been laid off (how can we support wars, give so much to other countries and not make certain our own people can use their talents to make the world better……that is my political comment for today), and again I was reminded how much these people give just to be able to Derby. “I hope we can make some money soon”. Many people came up to talk and say hello and tell me they followed me on Facebook and these blogs….We are all real friends who were just meeting for the first time in person. One wonderful man who was refereeing that day approached me very emotionally: “I want to thank you for giving my wife and me a purpose in our lives….she is out there skating now”. Well, obviously I had not done that, but the revival of my family’s game had. And I met the most beautiful boy baby. “His skating name is Evan Forbid” his mother said proudly. 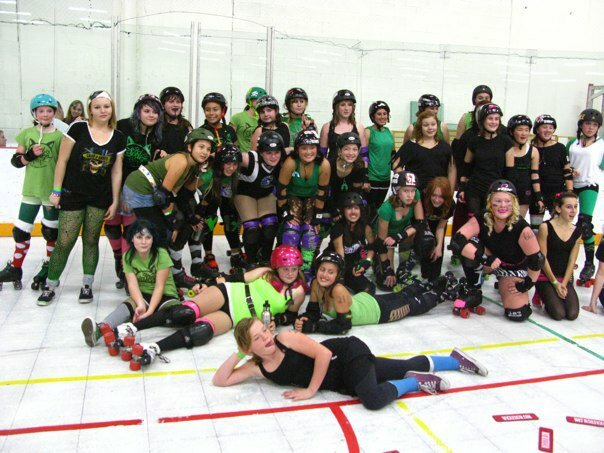 And then, the junior Roller Derby Girls: The Silicon Valley Roller Girls, so sweet and beautiful and tough. I asked one,”Did you beat the crap out of the other teams?” The 12 or 13-year-old gave a wonderfully wicked smile “yes”. And I know that this spirit of giving and contributing shown at Red Red is replicated wherever Roller Derby is being played. It is harder and harder for the women (and men) to pay for their skates, their equipment, their dues and the time they put in to give to their community. But the game keeps growing, some 700 leagues now in 25 countries. This Saturday the Milpitas Maulers (you see, the great Mall is in Milpitas) are coming to my house for their sock exchange and their team bonding; they are one of the newest groups. And I have been invited by the OSDA to come to Philly in mid January (oh the sacrifices I make) to see the progress of the professionally trained bank track skaters in that league. And believe me, there is even more excitement on the horizon. Every time I meet a new league I think who can be better than these women and I fall in love with them. Right now allow me to give my heart to Sac City. Please, please support your local leagues any way you can…..go see them play and not only will you see great family entertainment, but you will be keeping this great sport alive. Jerry, it was great to meet you right before we skated our second bout of the day (Yay Gang Green!). I think you were our good luck charm! Your continued support of all things derby is appreciated. An historic first trifecta happened this past Thursday. First modern derby game played in Asia. First roller derby of any sort played on continental Asia. 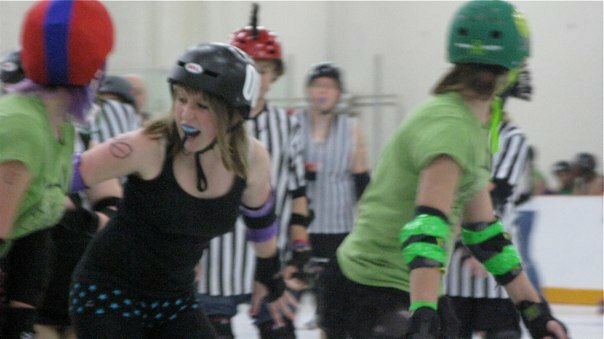 And the first roller derby played as a high school sport anywhere. This was apparently a sports program at a high school that’s attached to a college in Singapore. There is a women’s league in Singapore as well, they’ve just gotten their first shipment of quad roller skates (tough to get in many countries). While the adult league may include a few expats from Oz and NZ, it appears to largely be made up of Singaporians (SP?). As to “why Singapore?” I would suspect that it’s gotten there first because English is the country’s primary language. A week ago the first modern derby game in Mexico happened in Monterrey at a skate park. It’s safe to assume that some of the South American leagues will be playing soon. The greatest stumbling block to the growth of derby internationally is getting the gear. Pads, helmets, and 8mm bearings can be bought at any skateboard shop. Getting quads into even European countries is difficult and expensive. Quad skating completely died outside of the U.S and maybe “Down Under” once inlines took off in the 90s. Thank you for the information. Very exciting and “emotional” to read. I love this sport with all of my heart and to hear things like this makes me even prouder to be a part of something so great! Jerry as always, thank you for the report and your continued support. 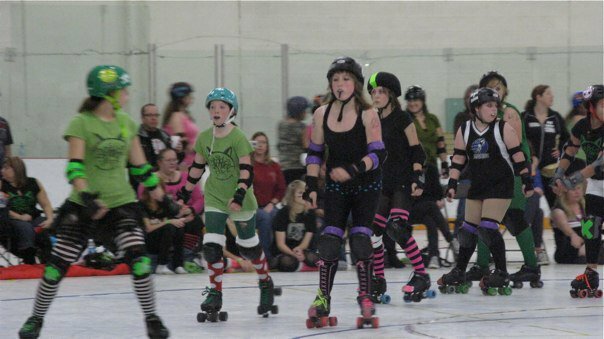 The first school roller derby bouts actually took place last year! I’m so excited to hear that it is happening in more schools. I’m a teacher at the Ann Richards School for Young Women Leaders in Austin, TX and we actually formed our school roller derby team in the fall of 2009, the Ann Richards Roller Girls (ARRG). We are in our second year as a team and can’t wait for more local schools to have teams for us to compete with! this was last year….this weekend RED RED is happening again.